Making pothole repairs, Jacksonville area business keep their business in good shape on the inside and outside. This is very important to maintaining key relationships, your customers, tenants and others visiting your facility. Commercial establishments need to ensure parking lots are kept free of debris and Jacksonville potholes repairs are made as needed. Not only do Jacksonville pothole repairs help keep people and property safe as they traverse through a parking lot, it also helps creates an inviting appearance. At CSG, no job is too big or small. We have been the preferred company for pothole repairs Jacksonville companies have asked for for more than two decades for a reason. We put our customers first and strive to meet or exceed their needs. If a Jacksonville pothole repairs company wants to close your parking area completely for days, that’s a problem. At CSG, our team can work around your business hours and requirements. 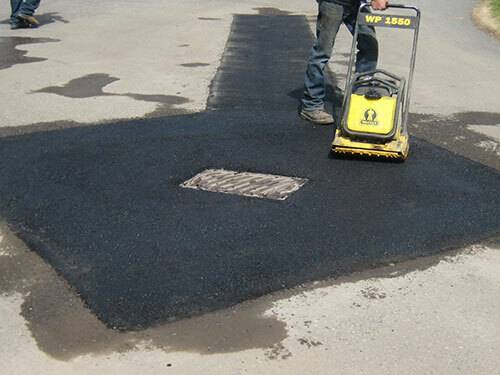 Often pothole repairs can be completed one section at a time, roping off work areas and opening them back rapidly. The vehicle flow should not be cut off to your parking area as the Jacksonville pothole repairs are made. What Type of Jacksonville Pothole Repairs Projects Do We Manage? With over 20 years of experience in the paving industry, we have seen many other companies come and go. We have passed the test of time in Jacksonville because we are focused on what’s important: customer satisfaction and quality workmanship. We believe that our services and Jacksonville pothole repairs are what keeps our clients happy and referring others to our company.